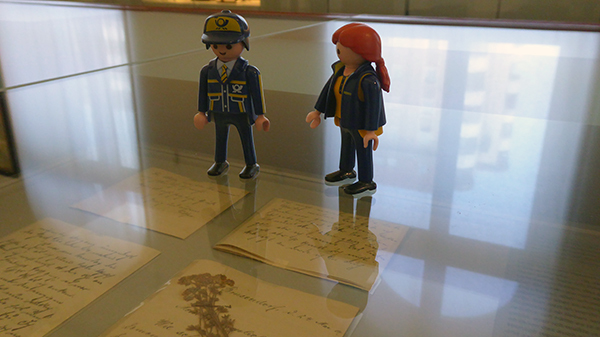 The Little Mail Carriers at the National Postmark Museum! 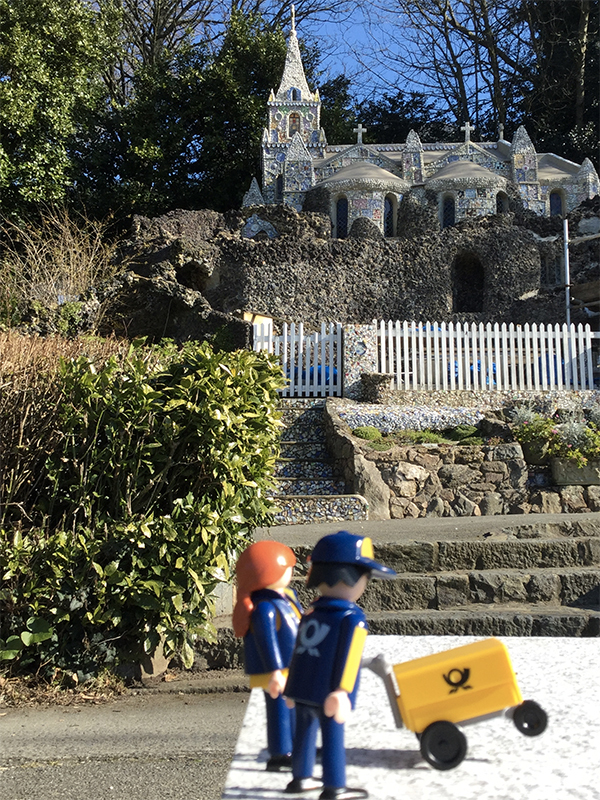 Earlier this year, we noticed a curious link on Terry’s (aka Terry5) profile… which triggered a few enthusiastic email exchanges, and eventually ended with the Little Mail Carriers jumping onto an envelope headed to Ohio to check out a very special place. 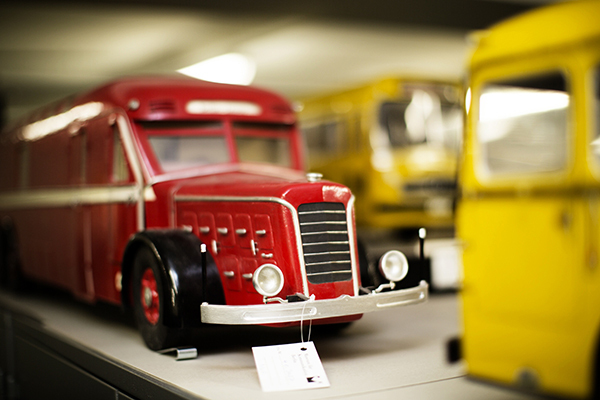 Come discover the Postmark Collectors Club, and their wonderful museum! Hi everyone! 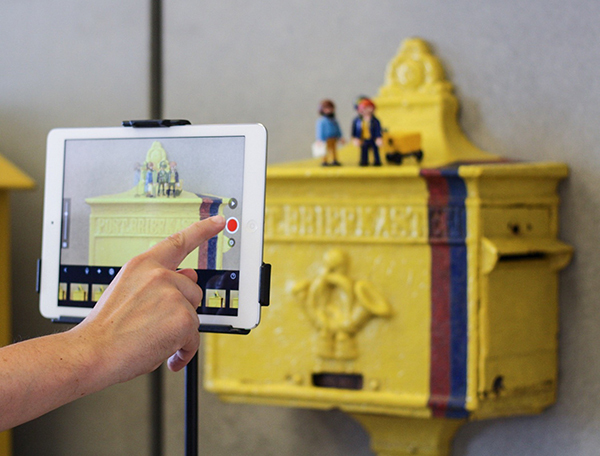 We traveled to the center of the USA to visit the National Postmark Museum, the premiere collection of the Postmark Collectors Club. Yes! 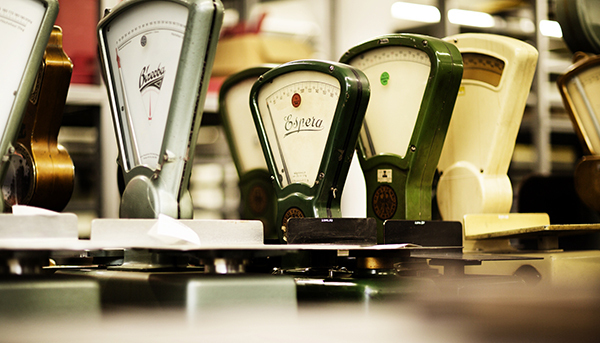 There is a whole club devoted to the collecting, studying and enjoying the trusted postmark! 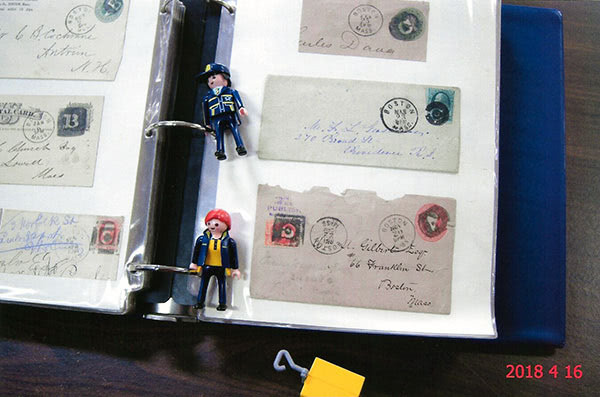 The Club has been around since 1946 and a few years later some of the Club members formed a group collection of postmarks. 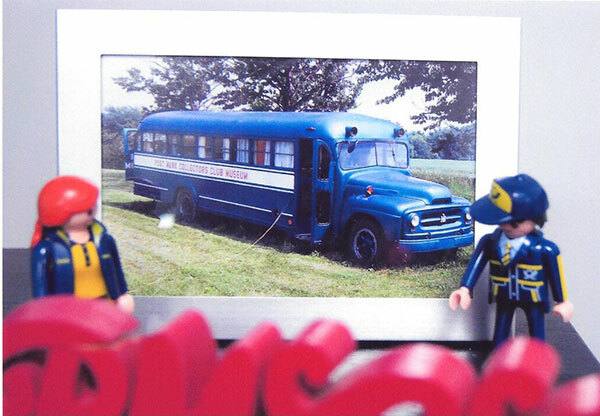 When the collection began to grow, they actually put it into an old School Bus! 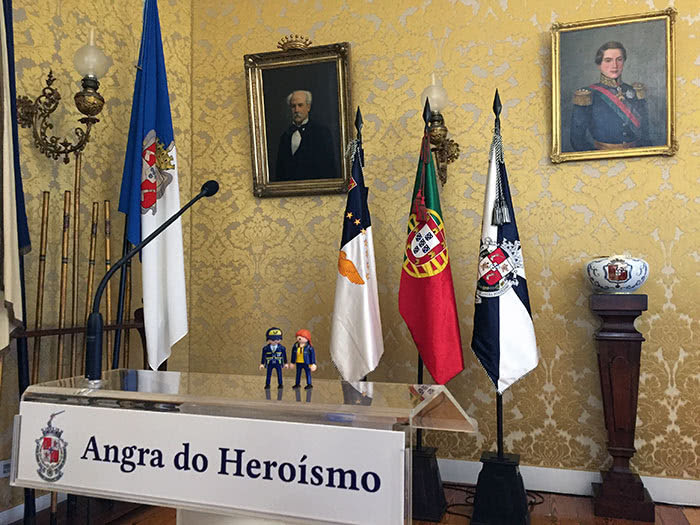 The club’s membership comes from all across the USA and many other countries. 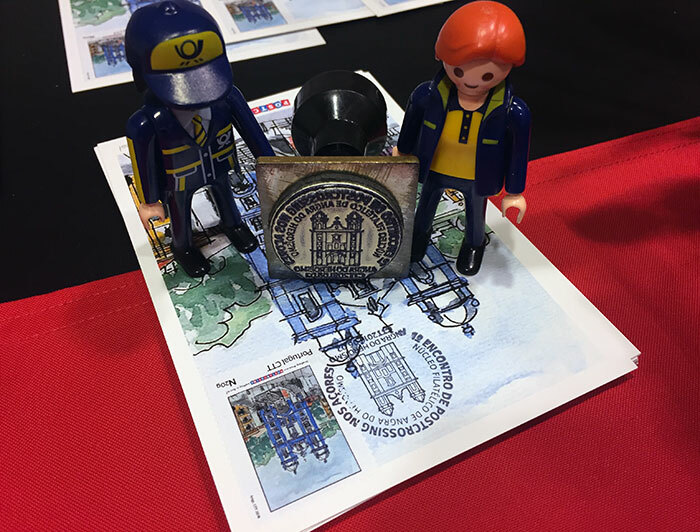 Each year they hold an annual convention somewhere around the USA, getting together to share postmarks, stories and good wishes. 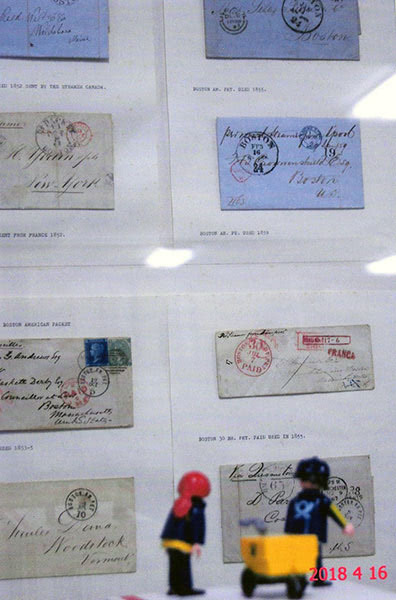 The Museum has continued to grow and preserve material important to the field of postmarks and postal history. The Museum has been in a few homes along the way typically moving to larger spaces to house the holdings. Then it moved to Bellevue, Ohio, USA, into the Historic Lyme Village, where it has been since 1978. 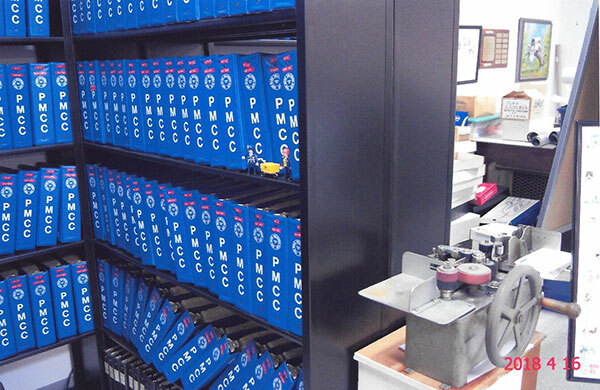 One of the largest single holdings is the Willett-Thompson Collection, and today it is held in more than 300 blue binders. We checked out many of the special collections including postmarks from Military Camps and Bases. 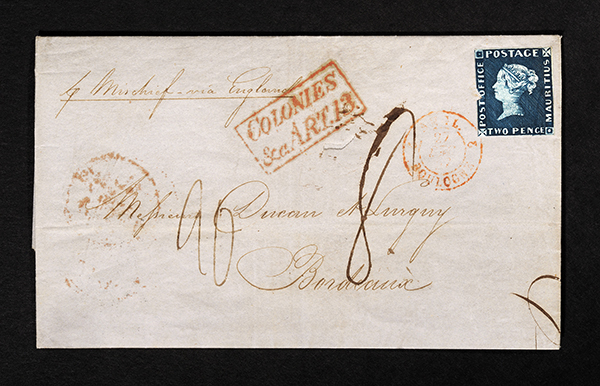 “First Day Cover” with postmarks that were only cancelled on the first day that a new stamp is issued by the Post Office. There are so many of these in this collection, covering many years. Some of the other special collections here in the Museum include postmarks with slogans, “Pray for Peace” cancels, and individual U.S. state collections. 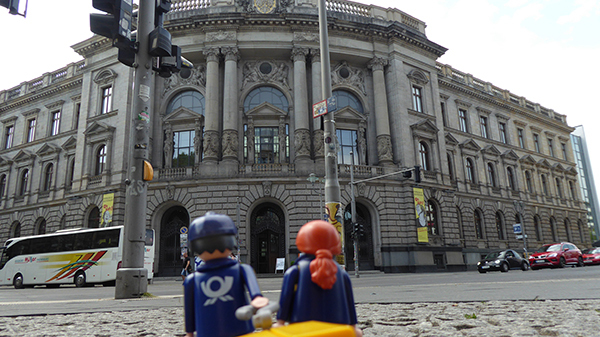 Being mail carriers, we moved over to our favorite part of the museum, a collection of Post Office photographs. 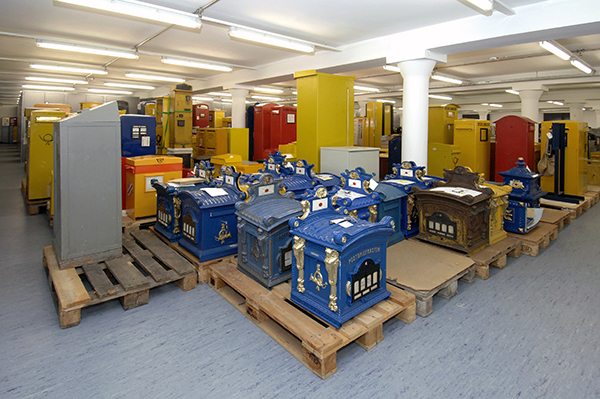 The museum has drawers and drawers holding more than 55,000 pictures of Post Offices including new and old ones, from around the USA and around the World. They have thousands more pictures in their on-line internet collection. 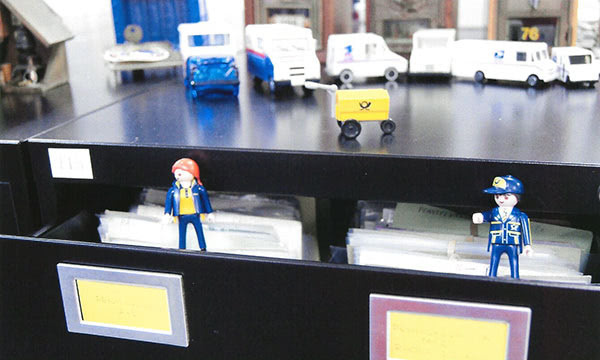 Another cool stop on our journey was the assortment of memorabilia and artifacts from Post Offices, hand stamps, canceling devices, sorting windows, mailboxes… and even some model mail trucks! 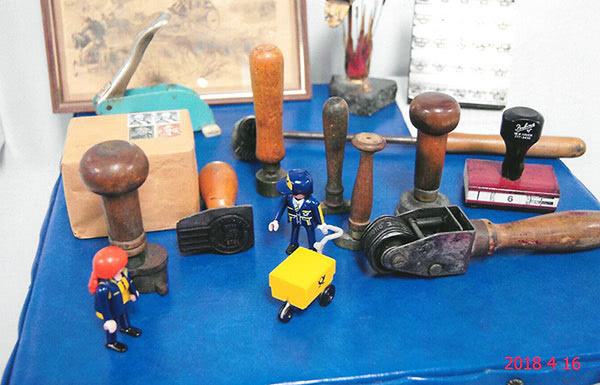 All of these tools helped move the mail. 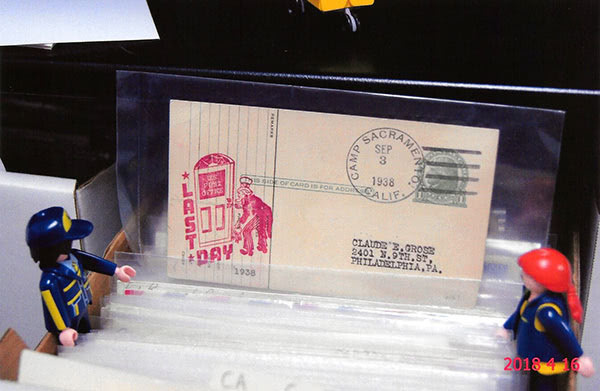 There is certainly a passion here for collecting and showing mail and postcards, especially those with interesting postmarks. Each letter and postcard has a story to tell and the cancel helps telling that story! 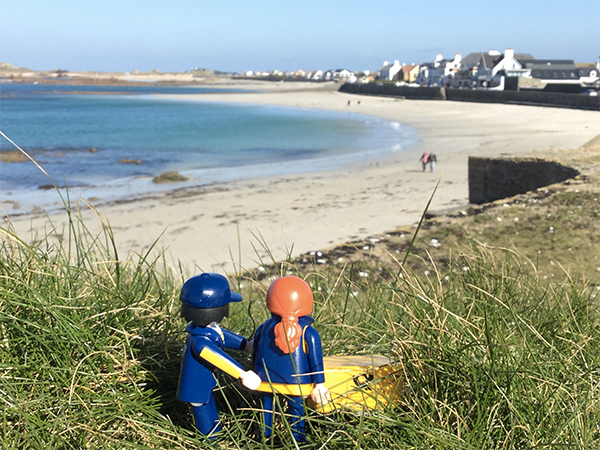 The Little Mail Carriers in Guernsey! 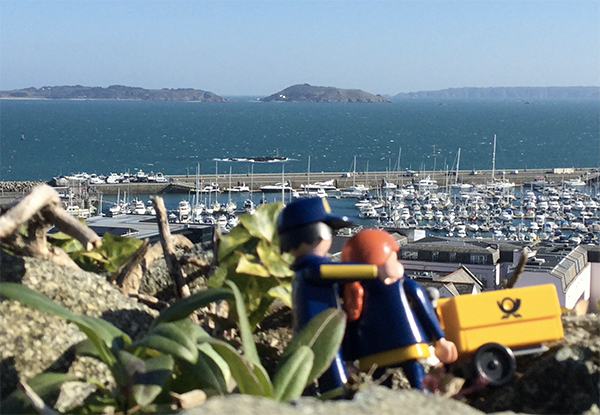 After their stay in London, the Little Mail Carriers did a detour to the beautiful island of Guernsey, to have a rest from the hustle and bustle of the city. Denise (aka Tranchile) was their host for the stay, and had fun showing them around, despite the windy days that coincided with their visit. 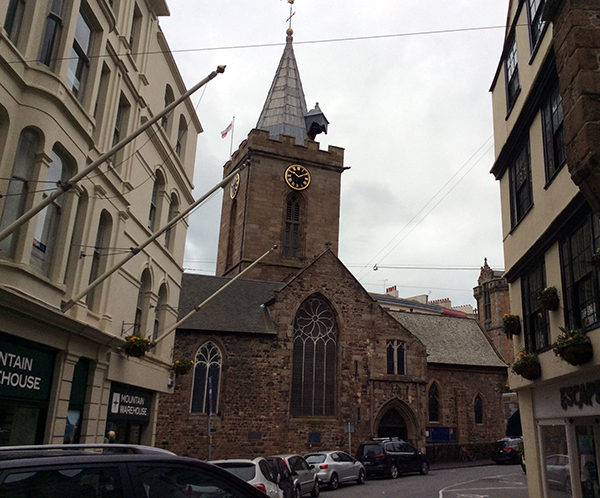 Hello from Guernsey! 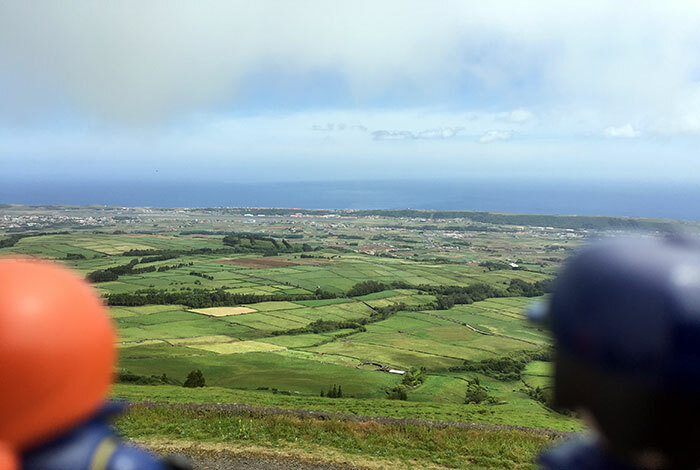  We’re so glad to be here with our host Denise, who promised to give us the tour of the island where she lives. Shall we get started? One of highlights of Guernsey is this tiny chapel (appropriately called “Little Chapel”), built by Brother Déodat in July 1914. It is meant to be a miniature version of the grotto and basilica in Lourdes, France and is covered in pebbles, shells and broken colorful china. Now and then, volunteers repair the damage done by the weather over the years… Denise even remembers donating a broken cereal bowl of hers for repairs, when she was a child! This is Cobo Beach, one of twenty eight beaches in Guernsey! There’s is a chip shop by the sea wall, and we saw some locals eating fish and chips from a bag there while watching the waves. 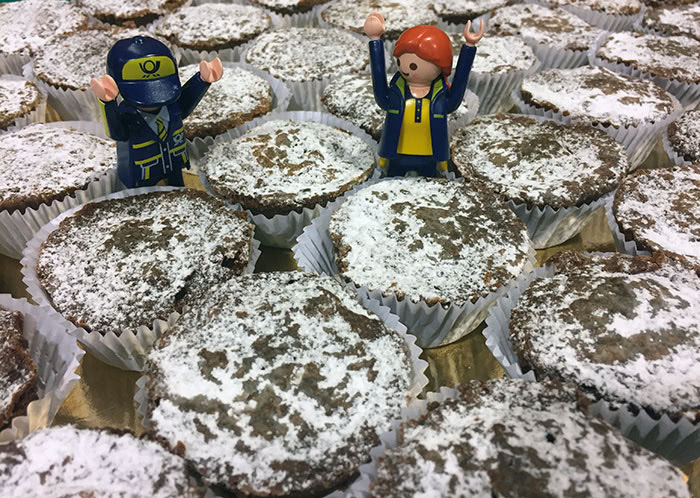 Denise tells us that a film screen is put on the beach at low tide during summer, and the hotel opposite has a balcony and there is a big rocks concert played from there whilst people sit on the beach and listen to it… Sounds wonderful! 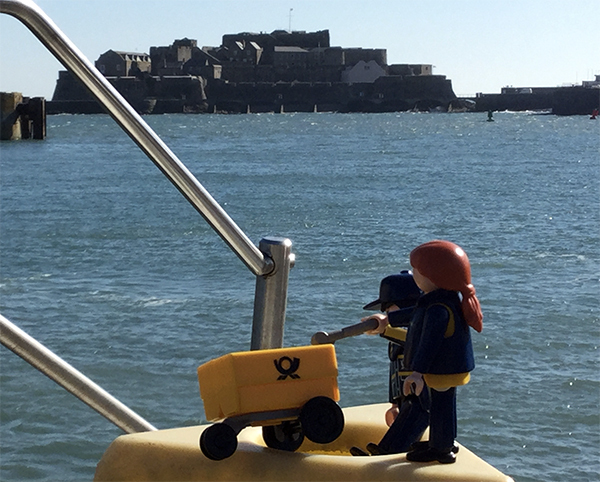 We were hoping to visit one of the other Islands that come under the Bailiwick of Guernsey, but during our stay it was unusually windy and the ferries were cancelled. :( We had to hold onto each other whilst looking over the QE11 Marina at three of the islands instead. From left to right, the first island is Herm, and you can just see the glorious sand there. It’s a quiet place with just one hotel, several cottages to rent and two camp sites. It also has a school for just about six children and the staff who work there. Jethou is the middle island, which is privately leased and not open to the public, and the bigger island on the right is Sark. It has no traffic, but if you are fit you can cycle around the island, or use horse and carts to go around at a more gentle pace. Above you can see Castle Cornet, which was built in the 13th century, to defend the islands from the French. It’s been attacked and captured several times over the years, and finally returned to the islands in 1947 after reconstruction. Today it houses several museums and period gardens, and this half-term the schoolchildren have been dressed as Harry Potter characters and making spell books etc inside the main museum. How fun! 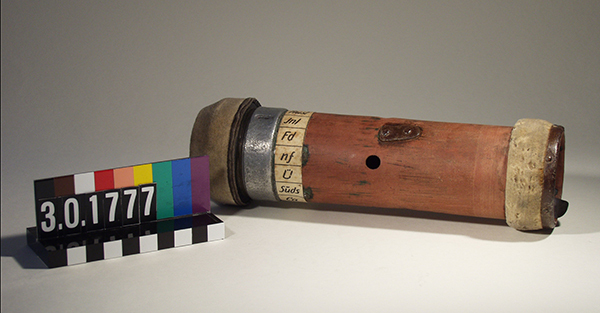 In the summer, a cannon is fired there at noon each day, which Denise tells us can be heard all over the island. 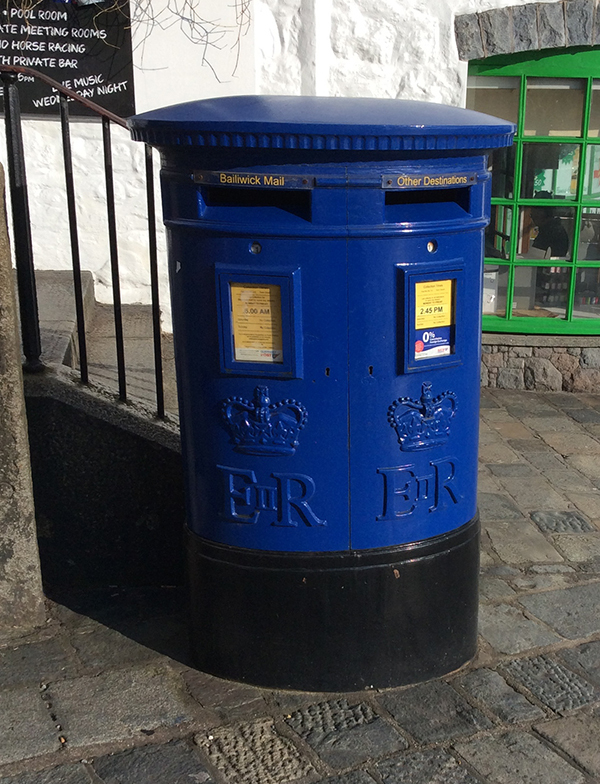 This is something we were looking forward to see: Guernsey’s Number 1 Postbox! 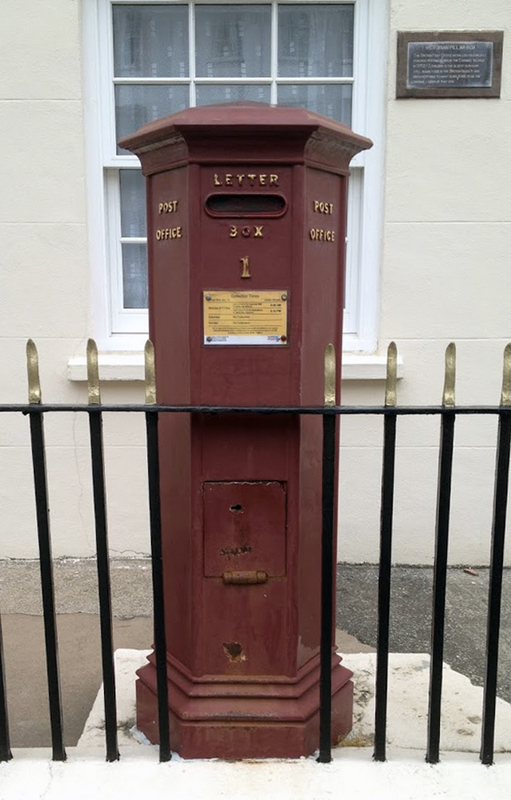 It is the oldest working postbox in the British Isles and was put there by the Post Office Surveyor Anthony Trollope on 8th February 1853, as an experiment to see how well they would work for collecting mail. He had been impressed with the system of pillar boxes in France, and decided to test them on the Channel Islands. The experiment was so successful that they were later introduced in the UK. 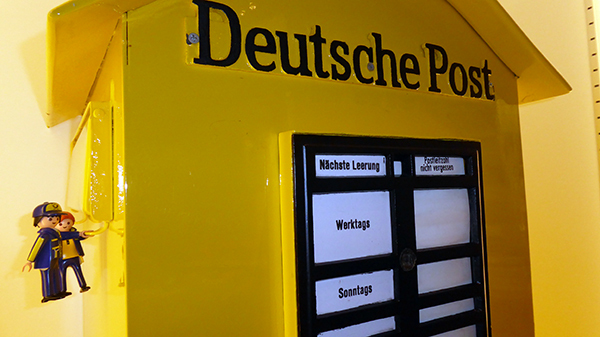 Although the first postbox was red, all the modern ones are a lovely blue color. 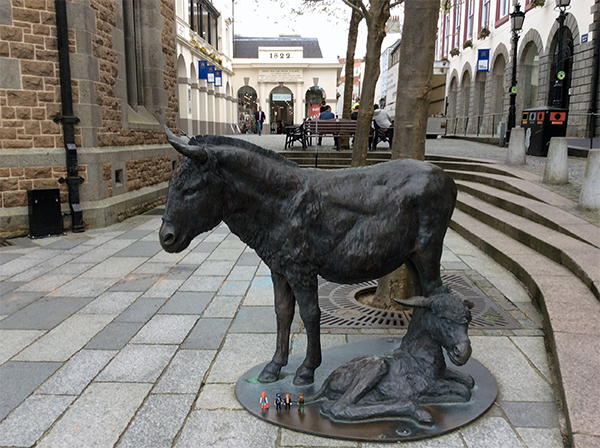 The Market Square is a lively place in St. Peter Port, and it was there that we met 2 little friends, next to this curious statue… Can you guess why they made a statue of donkeys? It turns out that people from Guernsey are nicknamed “Guernsey Donkeys”, while those from nearby Jersey are known as “Crapauds” (or toads)! 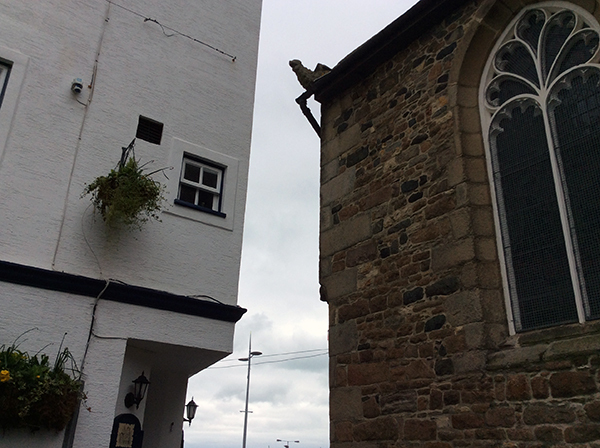 Since we were just around the corner from it, Denise and our friends took us to see the Town Church, built in 1475. We looked up in awe at its beautiful stained glass windows and ornate pews, where the Liberation service is held every year on May 9th. 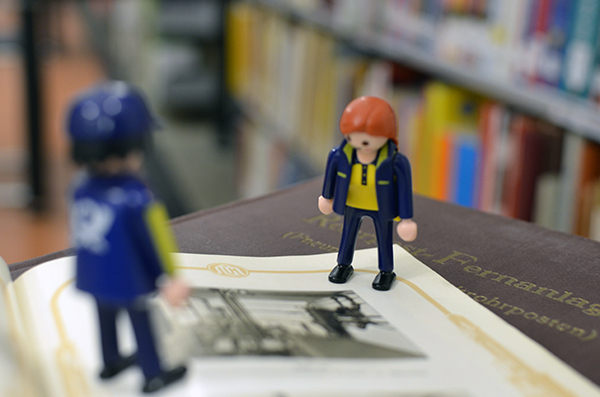 See you later everyone… or, as they say around here, à la perchoine!